Louis Wolcher is Professor of Law Emeritus at the University of Washington Law School. His primary research interests are in the fields of philosophy of law, legal and political theory, and human rights. 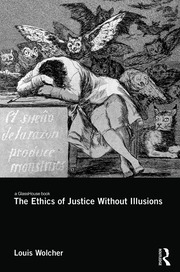 The author of more than fifty articles and book chapters, he has also published three books on Routledge’s list: Beyond Transcendence in Law and Philosophy (2005); Law's Task: The Tragic Circle of Law, Justice and Human Suffering (2008); and The Ethics of Justice without Illusions (2016).